Jaffna was in chaos in the third week of April 2001. The LTTE was on the offensive and the troops were on the defensive. But, repeated attempts to halt the LTTE advance east of the city had failed. The Tigers were on the verge of driving the Army out of Jaffna after their success at Elephant Pass. KKS harbour and Palaly air base were under heavy mortar and artillery attacks. The enemy’s 12-barrel Multi Barrel Rocket Launchers [MBRLs] were in action. Withdrawing units were bringing in bodies of officers and men to the city. Everything including ammunition was in short supply as regular supplies could not be moved in due to enemy attacks on the KKS harbour and the strategic Palaly complex, home to Security Forces Headquarters, Jaffna. The LTTE was calling the army to surrender and people and some politicians were talking of inviting India and other friendly nations to evacuate the Army. The Army was in disarray. However, in a last bid to halt the LTTE advance, crucial changes were made in the top command and control structure of the Armed Forces. These changes included the creation of the post of Overall Operations Commander [OOC] North responsible for Jaffna, Kilinochchi, Mullaitivu, Mannar and Welioya. Major General Janaka Perera, the then Deputy Chief of Staff and Major General Sarath Fonseka, the then Quarter Master General and Director General General Staff [DGGS] were ordered to fly there and take whatever steps necessary to stabilise the situation. Rear Admiral H.R.Amaraweera was named the senior naval officer in the north. These appointments were made immediately after the Government ordered the army’s 54 Division to abandon Elephant Pass. Perera was appointed the OOC. Fonseka was named the Security Forces Commander, Jaffna. They succeeded in Jaffna. There was no point in going into detail about what they did in Jaffna. Perera, one of the few officers who played key roles in battles against the JVP and the LTTE, will be always remembered for vowing to defend Jaffna at any cost when he addressed the nation over the Independent Television Network [ITN] when the LTTE was just outside Jaffna. He came live over the ITN, urging the deserters to return and fight alongside their colleagues in the Jaffna theatre while stressing the need for the entire nation to support the Army. Perera’s speech captured the attention of the Colombo based correspondents of international news agencies. At that time politicians were nowhere to be seen or heard. They did not want to face the people. But, the OOC who was confident of the fighting capabilities of the Jaffna troops, was able to give a guarantee that Jaffna would be defended. The Forces succeeded in halting the enemy advance just outside the town until the Government flew in Pakistani and Czech supplied MBRLs and other weapons to reinforce them. Their success paved the way for “Rivikirana” and “Kiniheera” offensives to get underway in the first week of September. Perera had been involved in previous operations against the LTTE. During the 1992-1993 period he organised a series of highly successful operations that caused heavy losses among the LTTE groups operating in the Eastern theatre. At the end of the second JVP inspired insurgency, the Independent Brigade comprising Commando and Special Forces was formed under Perera’s command. In June 1993, he was made the General Officer Commanding [GOC] of the Reserve Strike Force [RSF]. Then he was moved out of the East in 1995 shortly after he expressed fears of a major LTTE build up during the time the group had a 100-day truce with the Government. He was appointed the Welioya Brigade Commander. Some people accused him of seeking to sabotage peace talks. But when the LTTE resumed hostilities and sank two gunboats at Trincomalee on April 1995, people knew what Perera was talking about. About three months after the resumption of hostilities, the LTTE mounted a major sea-borne assault aimed at wiping out army detachments at Welioya. If they succeeded, Perera would have been probably accused of allowing the LTTE assault for political reasons. But, what happened surprised even his critics. The LTTE suffered their first big defeat in the Eastern theatre [Welioya included] at the hands of the troops under Perera’s command in July 1995. The 11-hour Welioya battle shocked the LTTE. Troops and homeguards under Perera’s command repulsed a major LTTE sea-borne assault on Kokilai, Kokkuthuduwai, Janakapura, Jayasinghepura and Army’s sixth Brigade Headquarters, Welioya. At least 300 terrorists were killed. The LTTE was forced to withdraw leaving bodies and a large stock of armaments. Perera returned bodies of about 200 cadres to the LTTE through the ICRC. That was the first major transfer of LTTE bodies through the ICRC and also the first heavy defeat the LTTE suffered in a single battle. Only two personnel under Perera’s command were killed. The successful defence of Welioya prevented LTTE leader Velupillai Prabhakaran’s plan to trigger a massive exodus of Sinhalese civilians out of the area. If the LTTE succeeded in inflicting a major loss on the Army and forced the Sinhalese to flee Welioya, the Government would not have been able to concentrate on the combined security forces operation, “Riviresa” that drove the LTTE away from Jaffna town area by December 1995. 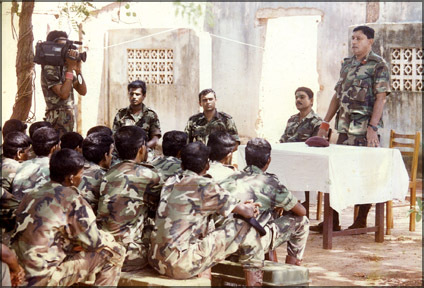 Maj. Gen. Perera with troops. Perera contributed immensely to the “Riviresa” success. Under his command, the elite 53 Division, then known as the Reserve Strike Force [RSF] comprising Special Forces, Commandos and Air Mobile troops, played a crucial role in the campaign that involved two other divisions, the 51 and the 52. Brigadier Perera was promoted to the rank of Major General on April 15, 1996 along with Brigadiers P. A. Karunatilake and Neil Dias. They commanded the three Divisions that were involved in the “Riviresa” campaign. Dias was the General Officer Commanding [GOC] of the 51 Division. His deputy was Sarath Fonseka. Karunatilake was the GOC of the 52 Division. His deputy was Anton Wijendra. Perera was the GOC of the 53 Division. Brigadier Percy Fernando at Elephant Pass was his deputy. The success of “Riviresa” depended on a major battle that occurred at Ponnalaikadduwan-Navakkeri and Puttur west-Avarangal in the first week of October 1995. Operation “Thunder Strike” was launched in October to expand the defences of Palaly in a bid to give some extra protection to aircraft and helicopters operating out of the base. At that time the base was under regular mortar attacks. Troops engaged in the operation were able to capture about 25 square kms southeast and east of Palaly and were engaged in consolidating their defences when the LTTE struck. The enemy assault was very similar to the one that forced the Army to abandon operation “Leap Forward” less than four months ago. The main attack was directed on troops under Perera’s command who succeeded in inflicting heavy losses on the enemy killing at least 200. At least 120 bodies were returned to the LTTE through the ICRC. The LTTE never recovered from that shock. Then “Riviresa” campaign was launched on October 17 and came to an end on May 12 after troops regained Point Pedro. Perera was involved in many offensives. Both seniors and juniors valued his opinion as they knew that his contribution and also his immense knowledge in handling counter-insurgency operations or high intensity battles against the LTTE. 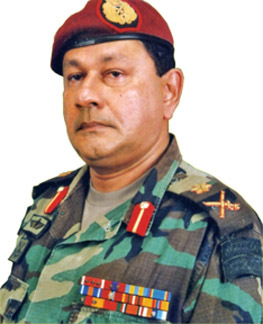 Perera, the first paratrooper to become a Major General retired from the Army after serving the nation for over three decades.